The sovereign spirit of the cosmic autumn who incarnates into the world at the approach of the cosmic autumn, a role adopted by Jeung-san Sangjenim, the Sovereign Ruler of the Universe who incarnated into the Eastern land of Korea in the nineteenth century. The mission of the Autumn God is to harvest the fruit of humanity at the time of the Autumn Gaebyeok and bring forth the cosmic autumn’s world of fruition, maturation, and unification. ▍ Seosin (서신西神) as the Autumn God. Seosin (서신 西神) is often translated as “the Autumn God”. Literal meaning is “the God of the West.”Seosin (서신 西神) “the Autumn God” is the sovereign spirit of the cosmic autumn who incarnates into the world at the approach of the comic autumn. The role of the Seosin (서신 西神) was adopted by Jeung-san, the Sovereign of the Universe who incarnated into the Eastern Land of Korea in the nineteenth century. The mission of “the Autumn God” is to harvest the fruit of humanity at the time of the Autumn Gaebyeok and bring forth the cosmic autumn’s world of fruition, maturation, and unity. In traditional Eastern philosophy’s theory of the five elements, autumn is associated with the element metal and the direction west. ▍ The God of the West. Seo (서 西) means “west” and sin (신 神) means “God.” Seosin (서신 西神), “the God of the West” can also be translated in Eastern cosmology. 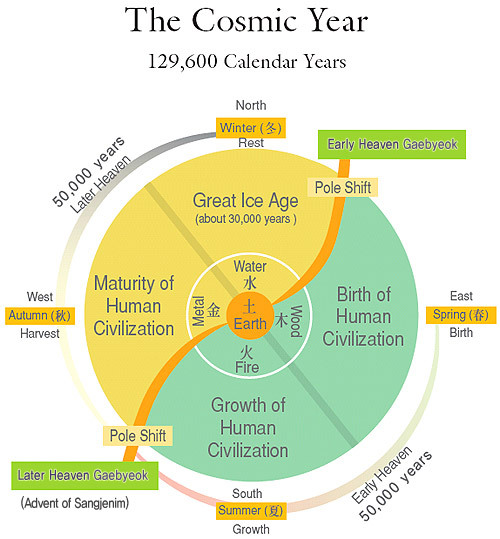 In accordance with the principle of the five elements, the direction ‘west’ and the season ‘autumn’ are spatial and temporal dimensions rooted in the element ‘metal.’ With this in mind, the original Korean term Seosin “the God of the West” has been understood as “Autumn God” to better emphasize the character of this god. In Jeung San Do’s terminology, “the God of the West” is Sangjenim, the Sovereign Ruler of the Universe, who incarnated into this world at the transition from the cosmic summer to the cosmic autumn. “the God of the West” incarnated into this world to render judgment upon humanity, harvest the fruit of humanity at the time of the Autumn Gaebyeok, and usher in a new civilization of sublime maturation and unity of cosmic autumn. Sangjenim selected the title “the God of the West” for Himself as an expression of His motivation for incarnating into this world. The Father who sits on the great white throne, as described in the Christian Bible, is the Seosin (서신 西神), “the God of the West”, and His white throne symbolizes autumn energy. In short, “the God of the West” is Sangjenim, who is ‘the God of Judgment’ or ‘the God of the Harvest. ▍ The qi of autumn is the sin (신 神), the spirit. At the time of the Autumn Gaebyeok, the new energy of heaven and earth will open. This autumn energy brings maturation to all life and existence and unifies all consciousness into one. This energy is completely different from the energy of the cosmic spring and summer, for as Sangjenim said: “The qi of autumn is the sin (신 神), the spirit.” (Dojeon 2:110:6). The energy of heaven and earth during the Autumn Gaebyeok is lethal qi and it is the Seosin (서신 西神) “the God of the West” who will bear it as they kill all life and stop the growth of the Early Heaven. Sangjenim described this as “the benevolence of giving birth in the spring and the sternness of bringing death in the autumn” (Dojeon 8:37:2). has been the ultimate purpose of the universe since its creation. It is for the purpose of this harvest that west spirits will appear bearing lethal qi and mercilessly withdraw life from all beings, save for those who attain fruition.